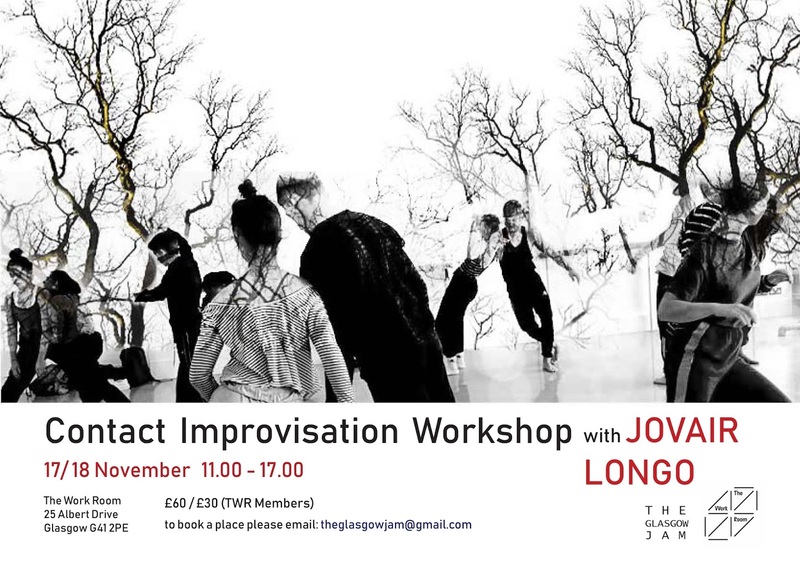 Jovair’s contact improvisation teaching plays with combining improvisation with learned set movements. He encourages movement to be developed from the opening of spaces and support around the joints and the whole body in order to develop a soft responsive body. Paying attention to the senses leads to the awakening of the body’s imagination, which feeds into the uninterrupted flow of movement. Jovair works with different layers of perception to foster effective movement communication through physical contact. The detailed study of different aspects of partnering leads to the development of technique and skillful dancing. In Jovair’s work, the interpersonal experience of contact improvisation is considered a way of becoming aware of patterns that are beyond the physical. He facilitates learning in a focused and playful environment where both the personal and the collective feed into individual learning. Biography: Jovair Longo is originally from Brazil. He has been based in the UK since 1990 and last trained in The Netherlands, at the EDDC-Arnhem. As a dancer he has worked with Yollande Snaith Dancetheatre for several of its productions and has also worked with Earthfall Dance-Cardiff, Gaby Agis, Rosemary Lee and a few other companies, both from the UK and Europe. 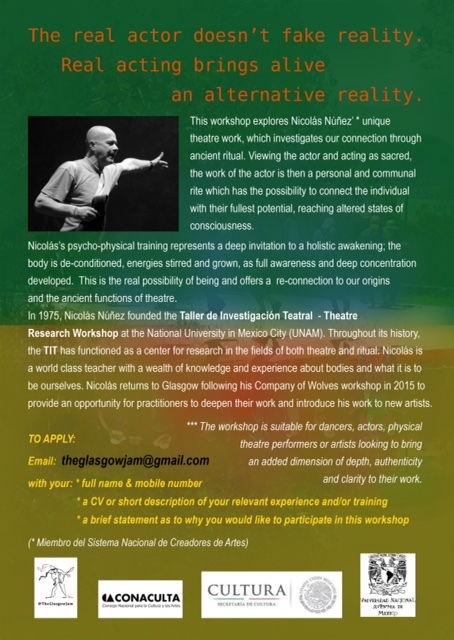 He has developed his teaching alongside his performing work and has taught at different schools including the Laban Centre, Surrey University, London Metropolitan University and the Italian Conti Academy (London South Bank University). He has been teaching Improvisation, Partnerwork and Composition at London Contemporary Dance School since 2003 and regularly teaches at Scottish Dance Theatre in Dundee as well as at festivals both in the UK and Europe. Andrew takes a ‘skills and spirit’ approach to teaching improvisation. We will engage in the skills of engagement necessary to find content from breath, voice, movement and the imagination and we will amplify these skills using the spirit of communication necessary to engage an audience. We will start with work with movement and then add voice, breath and imagination. We will constantly explore the spirit of communication as a motivation for choice making. Through this process participants develop the skills of generation and shaping content whilst working between physical and vocal modes. We will also develop a specific form of feedback that will support us in performance. When combined, these elements form a reflective practice that Andrew believes is essential in the development of consistency in solo improvisational performance. Participants are encouraged to become their own editor in performance, using the skills of shifting their point of attention, developing texture and maintaining clarity. Participants should also come expecting to enjoy themselves. 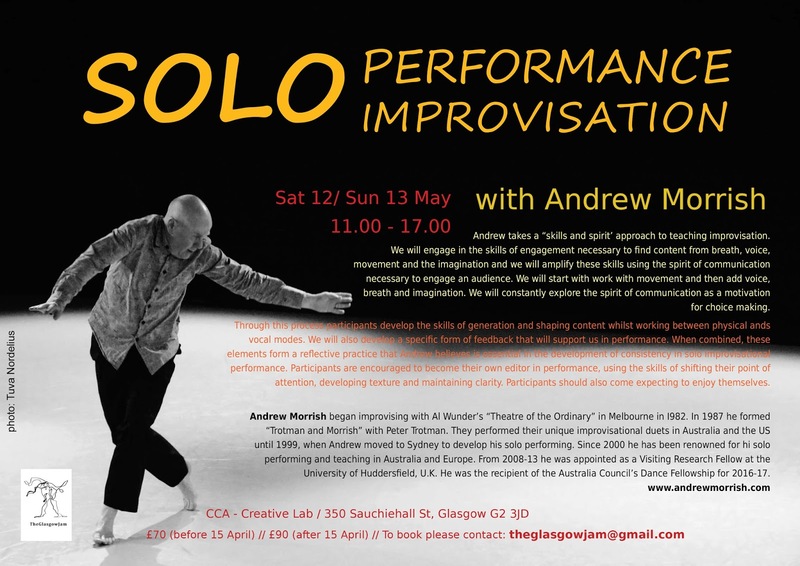 Biography: Andrew Morrish began improvising with Al Wunder's "Theatre of the Ordinary" in Melbourne in I982. In 1987 he formed "Trotman and Morrish" with Peter Trotman. They performed their unique improvisational duets in Australia and the US until 1999, when Andrew moved to Sydney to develop his solo performing. Since 2000 he has been renowned for his solo performing and teaching in Australia and Europe.From 2008-13 he was appointed as a Visiting Research Fellow at the University of Huddersfield, U.K.He was the recipient of the Australia Council’s Dance Fellowship for 2016-17.In 2018 he will be teaching in Glasgow, Berlin, Paris, Gothenburg, London, Cologne, Warsaw, Amsterdam, Poznan, Bouxwiller, Adelaide and Melbourne. 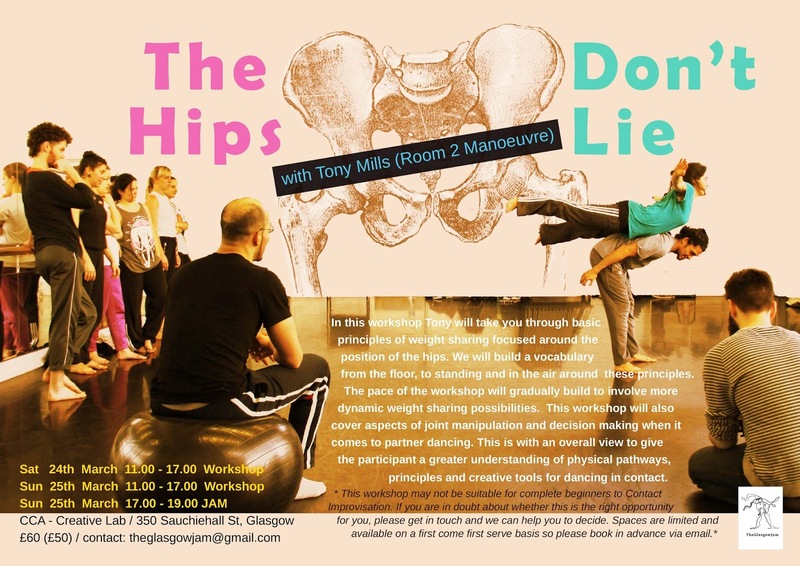 In this workshop Tony will take you through basic principles of weight sharing focused around the position of the hips. We will build a vocabulary from the floor, to standing and in the air around these principles.The pace of the workshop will gradually build to involve more dynamic weight sharing possibilities. 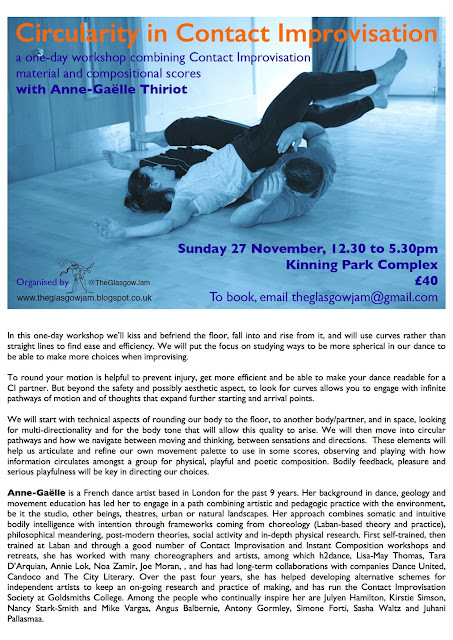 This workshop will also cover aspects of joint manipulation and decision making when it comes to partner dancing. 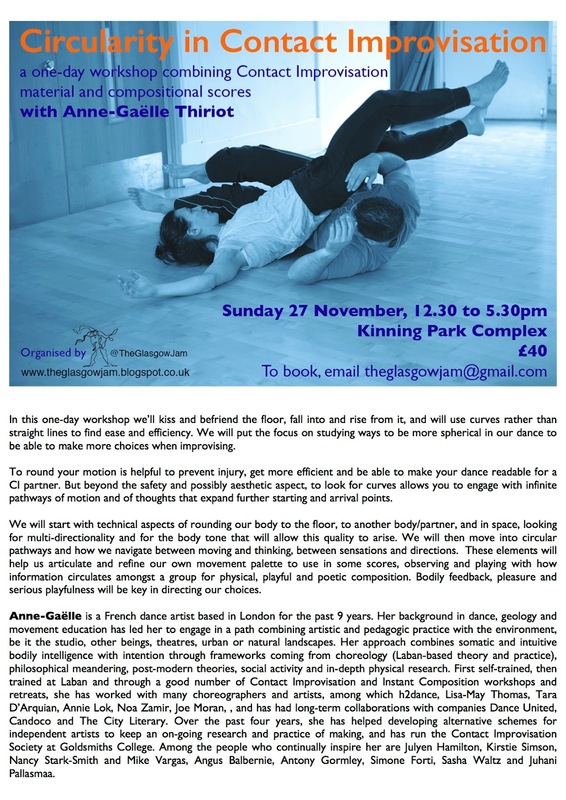 This is with an overall view to give the participant a greater understanding of physical pathways, principles and creative tools for dancing in contact. Using relaxation and movement techniques grounded in the Bates method of vision education we will explore how our attention and intention affects how we see and how we feel. Vision is a learned sense that we can continually attend to and we will encourage new ways of using our eyesight. Aspects of vision we will explore include peripheral and central sight (and the relationship between them) and our senses of perspective, colour, movement and depth. You are encouraged to bring warm layers, as there will be times of stillness in the workshop. You are invited to explore your natural vision for this workshop. This means that if you wear glasses you can take them off or if you wear contact lenses please bring what you need to take them out. Contact Improvisation experience is not necessary. 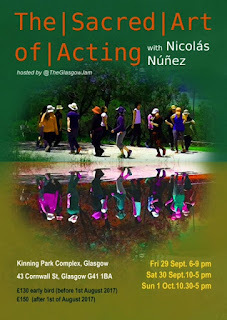 To book your place, please email us at: theglasgowjam@gmail.com with the subject header 'Embodied Vision'. 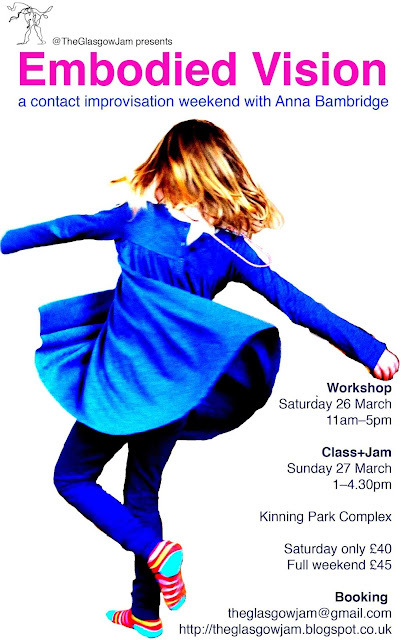 Lunch by Ali (who has been making delicious cakes for the jam) will be available for purchase for this workshop. 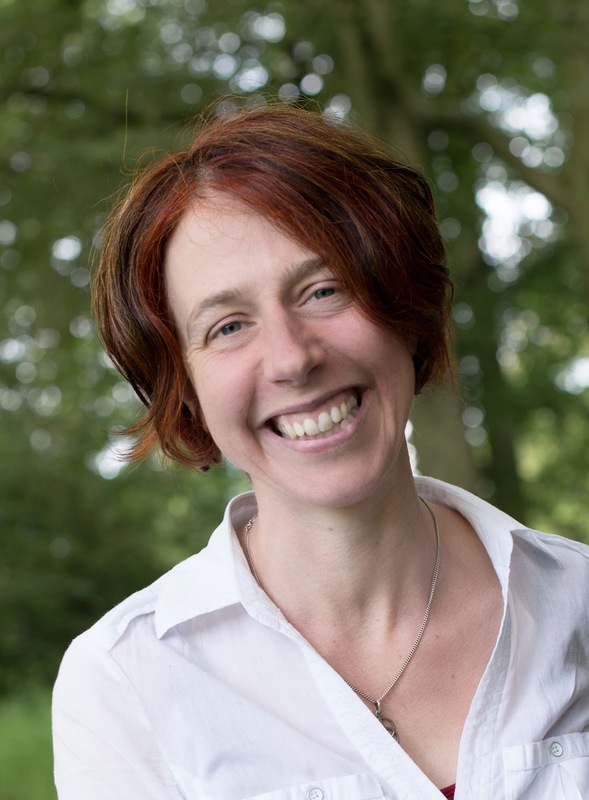 This workshop considers the possibilities for composition within CI. We'll take our practices of working closely with a partner into choices of space, rhythm and dynamics and understand how they can sit as part of a much larger composition. Exploring our spatial arrangements in solos, duos and ensembles we can begin to compose where and how we move and how this impacts the composition of the group. We will begin to understand how a potential audience may see the space, bringing our CI practice into composed structure. A workshop for those looking to bring a sense of composition and choice their CI/Jam practice.